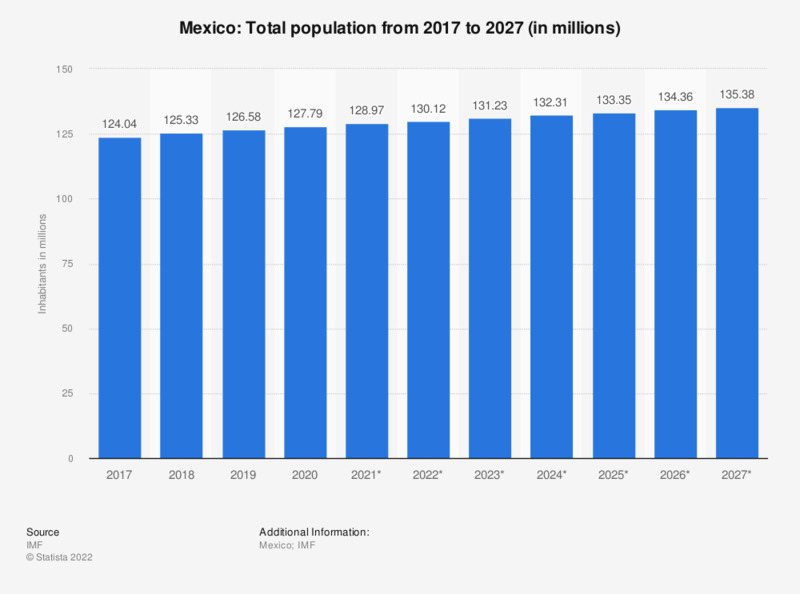 The statistic depicts the total population of Mexico from 2012 to 2017, with projections up until 2022. In 2017, Mexico's total population amounted to about 123.52 million people. The total population of Mexico was expected to reach 116.02 million people by the end of 2013. Despite being the source of one of the largest migration flows in the world, Mexico has managed to maintain around a 1.25 percent population growth rate for the last several years, roughly the same growth rate as India. Among the largest cities in Mexico, Mexico City is leading with more than 8.5 million inhabitants. A slowly declining fertility rate still holds above the replacement rate, and life expectancy is growing, expanding the population from both ends of the age spectrum. With the rising life expectancy, the median age of Mexican residents has also increased, and an increasing stream of immigrants from the financially-troubled Spain has also boosted population numbers. The majority of the Mexican population is Roman Catholic, owing to its colonial Spanish background. Spanish is the predominant language, with several regional and local dialects spoken, but a number of indigenous languages, such as Nahuatl, survive and are also spoken around Mexico. One worrying and relatively recent trend in Mexico is the growing share of the population becoming overweight or obese. It is not entirely clear what sort of effect the obesity epidemic is going to have on Mexican population numbers in the long run, but is starting to manifest itself not just in physical appearance, but in the increased rates of heart disease, hypertension, and diabetes. In fact, diabetes was one of the top causes of deaths for Mexicans in recent years.